It's back to looking like the old Century Class trucks. It also looks like a few grill bars are missing. They should sell them with that paint job...it's the most interesting thing about them. I would think that truck would be very hard to see in a snowstorm, quite dangerous. Although, hunters and survivalists would like it. 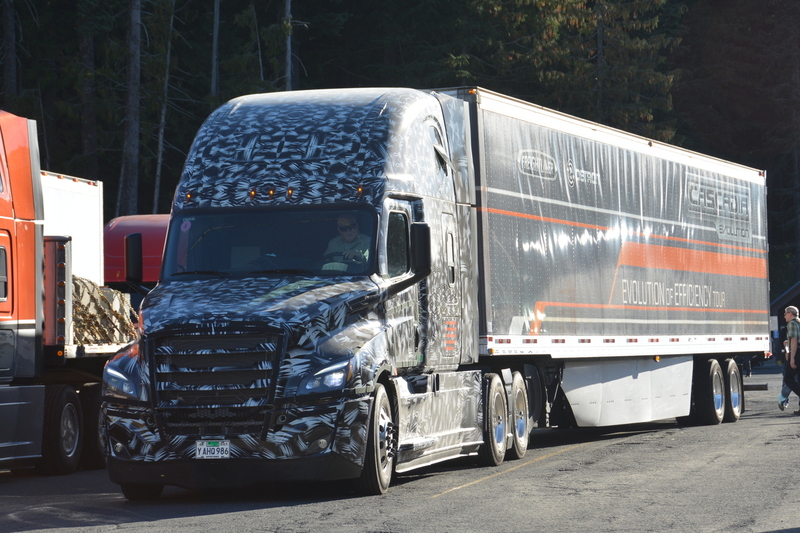 Some have wondered if the closeable grill bars will be available on the next Cascadia. And yeah, it does look like a Century. Is the sleeper a little bigger than they have offered up until now? I caught that same truck on a test run in Oregon in October, btw. So much for Dieselpower's bragging about "recently spied". Looks like it got sprayed with hot tar, and then followed a chicken truck. Maybe it's Freightliner's way of sucking in the rednecks: Come for the camo, stay for the fuel savings! It reminds me of one of those hastily camouflaged panzers that you see in pictures from the last winter of WW2. Must be the Daimler influence. Maybe - something is going on there. Perhaps they've lengthened the side fairings again? You mean to say there's actually a real, American, Freightliner influence? Your comment only serves to confirm the continued Germanification of the marque. Repeat after me: "Global Truck Platform." aka. One truck for the world. Everyone is doing it.